And we don’t have to add any asterisks(*) either. Tesla Model 3 sales in August hit an estimated 17,800 units, an all-time high for any plug-in electric car ever. Surely that’s impressive, but what if we look at it in a slightly broader way. Like, for example, how does that 17,800-unit figure stack up against say BMW passenger car sales. And no, we don’t mean just 3 Series sales, but rather all passenger car sales by BMW in the U.S. for the month of August. So, can we now safely say the Tesla Model 3 is a sales success? We firmly believe so. 341 Comments on "Tesla Model 3 Outsold All BMW Passenger Cars In US"
And if your numbers are right, Tesla’s total US sales for the month are trivially different from BMW’s. It should be pointed out that the average transaction price for the Model 3 is comparable to all those BMW cars, add the S/X in and Tesla had a much better month in the US than BMW did, even if you count their SUV sales. What? I was saying this was good for Tesla, I guess I didn’t word my post clearly. Tesla sold something like 23,000 vehicles total, which is very close to the BMW total above of 23,789. That’s really impressive for Tesla! Well the asterisk is “US Sales”. Because it leads people to erroneously think Tesla sales are killing BMW as a manufacturer. People have no idea that BMW produced over ONE MILLION vehicles the first half of this year. I don’t even see Tesla included on the linked list below during the first half of 2018. Has Tesla cracked the top 50 yet? Realize the three series is at the end of its cycle with the i3 in short production supply because of the imminent battery update. Elon said most recently, that the Goal of 10,000 Model 3’s per week production rate, is for June, 2019! December 2018, was the plan he aimed for, on July 28th, 2017, at the Model 3 Initial delivery event! It was predicated on hitting 5,000 per week by December 31st, 2017! Both dates have been pushed back 6 Months, due to reality not matching ideals! Yep! He set some extremely tough goals and has worked the company hard to try to meet them. In the process they continue to identify and eliminate production bottlenecks. Imagine if he hadn’t set hard goals. What would the sales for August have been? And in 2020 they’ll have the Model Y well and truly underway we can hope, plus roadster II. They need to build another factory! So far Tesla is only selling model3 in the US and Canada. BMW is going backward now across the M3,M4 andM5 because of the model3. And growth has now stalled for BMW in the US. Don’t forget the model3 rollout is just getting started and the tesla converts will never be going back to BMW, at least not until they have a comparable electric car, that could be 10 years away. When the Y comes out, BMW will be in really big trouble in the US. This is a portent of BMW’s future if they don’t get going on decent BEV’s. And don’t forget BMW was the largest exporter of vehicles by value from the US to foreign markets. No small feat. And BMW one of the most profitable brands. Yes, a little different than Tesla it would seem. Profits are the big advantage BMW has for the time being they should use them to make Tesla competitive BEV’s asap. The decline this year in BMW’s 2/3/4 series vehicles is only 2% more than last year, and the year before that. It’s the overall decline in the “luxury” sedan (and sedan market overall) that’s causing the majority of the year over year decline, not the Model 3. People that were buying 2/3/4 series are now buying more X CUV’s, as shown in the corresponding increase, and very minor difference in overall US sales year to year. US is an important auto market, and what happens here could likely happen in Europe. So they aren’t bigger than BMW yet. Give them 10 years. Also it means that they are a legit auto manufacturer. I’ll pull a number out of air and say in 4 years they are ahead of BMW. Really depends on how much lower BMW volume drops from Model 3 and eventually Model Y sales over the next few years. This is a very dynamic situation because it depends so much on human perception. Which is also why the FUD against Tesla is so unending. The US is not a very important market for the rest of the world anymore. If it were, BMW would sell an equivalent to Fords F150, etc. While the US is Teslas main market. Please compare worldwide sales, if you want to study the impact to one car to another company. The impact on BMWs US sales have been about 10%, on its worldwide sales 0.
what kind of stupid is this? The US is the worlds second largest car market. BMW is free to ignore it, but that is a ton of money. Pickup trucks are not where BMW can sell its overpriced logos. I have to laugh at Jopp and dam’s assertion that the US auto market isn’t very important to auto makers. Yeah, the #2 auto market is small potatoes. Sometimes the increasingly common anti-US thought pattern can blind a person to the obvious. .
Around 15Mn cars are sold every year in Europe, but the US sales are just over 17Mn. Yeah, that explains why so many foreign auto makers have built or bought auto assembly plants here. You get my vote for STUPID OF THE YEAR! Jopp , in 2 to 3 more yrs the Ultimate Driving Machine will be a Tesla with Autopilot ,there will be an App for that and Beamed to all Teslas via OTA,it will out corner your BMW ICE car,and blow it into the weeds of the ‘ring, the driver will be along just for the ride ,you can bet that Elon is going to Tweet that. Again, the US is the worlds second largest auto market. To say it is not very important is stupid. The only problem for the EV only producer is the current inhabitant of the White House (not for long?) is pushing trade wars across the globe. That’s hit them hard in China. Maybe when the Orange Moron is evicted, we can go back to normal. Right… because BYD or NIO do not sell in China, nor BMW will be heavily discounting their EVs if the 10% threshold is not met…. No one is saying that they’re bigger than BMW. The statement was that the Model 3 outsold the entire total of BMW’s passenger cars for the month. I can see the sales of the 3 to be HUGE when Tesla finally start their European deliveries. I doubt that Tesla will hit the numbers that the big 3 Germans are at. Tesla will need to have a substantial increase the number of vehicles they offer. Personally, I think Tesla will have more sales worldwide than Jag, and Infiniti in a couple of years. They may even surpass Lexus within the decade. Ima fan of Jag but Tesla passing Jag is pretty well a done deal at this point. Jag shipped just shy of 180k globally in ’17. Model 3 shipping rate alone exceeded that in August. PS: in case someone misunderstood me i’m not saying Tesla shipped 180k model 3 in August, obviously. However the number they shipped extrapolates to >210k per annum. Add on ~100k S/X and it’s only a matter of time before Tesla is ahead over the last 4 qtrs. If it’s not the case at the end of Q3 I’m pretty sure it will be by end of Q4. Warren, the point is that Tesla is beating BMW in the US. An EV car company is beating BMW in the US. let me repeat: Tesla is beating BMW in the US all across the board for it’s vehicles. Let me say again an ELECTRIC car company is beating BMW in sales. Is that sinking in yet? Tesla’s Mission Statement: “Tesla’s mission is to accelerate the world’s transition to sustainable energy.” With Model 3 Tesla has hit the traditional automotive industry squarely across the head with a 2”x4” to get their attention and challenge them to transition to EV beyond halo compliance. What Tesla has accomplished with Model 3 will serve its mission purpose to be a serious wake-up-call for the senior executives at traditional car makers but many of those senior executives will remain playing the roll of Monty Python’s Black Night not because they are courageous but because the human capacity to ignore reality through rationalization and denial is amazing human trait. According to hedge fund manager and King-of-Shorts Jim Chanos (president and founder of Kynikos Associates): Tesla is “not a leader” and “worthless” in value (Jim Chanos’s words). It’s astounding that non-leader worhless Tesla has “Outsold All BMW Passenger Cars In US”… /s. Like I said in prior above comment, the human capacity to ignore reality through rationalization and denial is amazing human trait… Chanos is working hard to maintain his anti-Tesla Wolfpack associates from defecting (several have already defected) from Chanos’s highly organized “take down Tesla” project… at this point Chanos is on his way to loosing what little credibility he has left… good. Do you work for CHanos? You seem to talk about him all the time. Yes, it’s “bad”, but all publicity is good publicity. Chanos actually has some credibility left? Not with me, he doesn’t! He (and a few others) are too busy moving the goal posts (yet again) to listen. You noticed how they keep changing the goals too huh! Nope! Not the Top 50 yet. They’ll crack the top 30 in 2019, though, in the process passing MG, Mini, Lada ,Saipa, Cadillac, Foton, BYD, JAC, Land Rover, Roewe, Baic, Chery, Trumpchi, Seat, Dodge, Haval, Volvo, Ram, GMC, Lexus and Dacia – possibly more as well as anyone between them and the current number 50 right now. By 2021, they’ll probably have passed BMW worldwide and possibly even Mercedes to crack the top 10. Pretty good for a start-up. The US hasn’t had a successful new car brand in a very long time. Look again. The 23789 BMW figure includes 9339 light trucks! Which are X6, X5 and X3, also known as SUVs. Based on that definition Tesla X is also a light truck. If you don’t want to be misunderstood, maybe you shouldn’t use the word “trivial” in your post. Could the BMW sales drop relate to the BMW caught fire, recently? LOL, yeah. Here I thought BMW will go otu of business when Model 3 starts selling 🙂 Instead, BMW US sales still increased by 1% yoy. But if that 17k+ number is solid, thne it is impressive for a month or two, for sure. Let’s see how this looks next Jan when Model 3 demand is saturated and tax credits are reduced. We are focused on how it looks now. Who knows what the future may bring. Now, we’re happy to report success and progress in the space. Yes, sure. Definitely something to celebrate. But at the same time, we should be mindful that this may or may not be a trend. We are likely seeing the peak Model 3 deliveries in these few months. BMW 3 series has been selling since more than 30 years. Once Model 3 has been selling for that long or even a few years, the sales numbers will also look lot more modest. See how the MOdel s&X sales have plateaued and are declining in most markets. Yep. We surely should check back in 30 years and see what’s changed. I can only imagine things might be different by then. BTW, are the Tesla numbers US+Canada, or just US? AFAIK, insideevs combines US+Canada numbers for Tesla. If so, this comparison is not quite apple to apple. Yes, it was a pretty big deal. We thought the site might crash! We only use US numbers, btw. He is now following InsideEVs, which is very surprising. He has 22.5 million followers, but only follows 64, and some are family. He doesn’t follow any automotive news websites or any of our competitors. We were very shocked to see that he is following us and sharing our sales numbers. This should further convince you that trying to keep an as much as possible neutral editorial line is the way to go. The guy is of course far from stupid, what would be for him the added value of monitoring a fanboys website when he is as busy as he is. Completely agreed. InsideEVs will not change, we are here to cover EVs, not just Tesla. I’m getting close to not reading Electrek anymore. Too much Tesla cheerleading and and bashing of other EV efforts. It gets old. InsideEVs tends to provide more balanced and nuanced coverage of all EVs. Electrek is what it is. That is to say, it’s a site maintained by a couple of enthusiasts. Nothing wrong with that, but I do look at it with a different lens than other sites. Also, I almost always skip the little “electrek’s take” bit at the end of articles. Canadian numbers are reported separately, about a week later. S/X totals are also excellent. August USA deliveries are a record for the 2nd month of a quarter. So you’re saying that Model 3 sales have not come at the expense of Model S/X sales? Hmmmm. When the model3 rolls out across the US and the car finds its way into all the Tesla stores and you can test drive it, demand will continue at high levels for the foreseeable future. Don’t forget Tesla has not pulled the lease trigger yet or rolled out the base model. AND they haven’t pulled the advertising trigger which BMW seems to have on rapid fire. Any way you smoke it, this car is going to be a permanent paradigm shifter which we haven’t seen the likes of before. We don’t know what the overall demand will be but Tesla will easily shift 10k per week globally. And if they can bring the price down in the future it could be way more than that. Model S & X sales have plateaued, because they are at their peak Cell Supply, and Production Line Capacities, as designed; not because of orders shrinking. That’s why Panasonic is adding additional production lines the next few months. No, the additional lines are 21-70 type cells and thus most likely for the continuing Model 3 ramp. S &X have parts other than batteries, and they use batteries with a slightly different chemistry and form factor (18650) by design. Lots of contracts in place over the whole value chain, I doubt that they can increase over the 100000 k mark. With the next refresh, let’s hope they move to the 2170 cells for the S/X models. Far better to use 2170s in the semi truck, MY, Roadster, and Pickup PRIOR to update S/X. In fact the 18650 is 100% Panasonic cells. The 2170 is Tesla Chemistry, production protocol, while Panasonic simply does the manufacturing that Tesla tells them to. Model S production and demand may have plateaued, but it’s certainly not shrinking, as the FÜDsters want us to believe. I think global Model X production/ demand is still rising, isn’t it? Maybe not currently, with the collapse of sales in China, but hopefully that’s a temporary situation. There’s still the European and Chinese market for the Model 3. I think there’s still pent up demand in these markets. This is exactly — and I do mean exactly — the same FÜD that serial Tesla bashers previously spouted about the Model S and the Model X. Say, when are the MS and the MX going to reach peak sales? According to the FÜDsters, that was going to happen years ago. So many ppl skip facts. Yet BMW sales in 2018 are UP year on year, although not at their peak, and they turned in the second half of 2017. Perhaps the fall was because people skipped buying 3 Series in 2016 and pre ordered the Model 3 instead, but if that’s the case then subsequent increase in sales when Model 3’s are being delivered does not bode well for continued sales of the Model 3 (after the intial rush people are moving back to BMW, more specifically BMW SUV’s). Alternatively there are other factors that affected the fall in sales in 2017, not the Model 3 but the factors the experts are mention – conventional competition and the move to SUV’s. Sure, there’s lokely to be an impact from the Model 3, but not as significant as you’re trying to make out (it’s another competitor in a small market, it’s going to take market share from the established brands, but it’s certainly not the main factor). A leased short range Model 3 will be Tesla’s highest “selling” model next year. With $3,750 federal and $2,500 California rebate baked into the lease, they won’t come close to meeting demand. Do you have your glasses on? Deduct the 9339 BMW trucks and rework your percentages. I think model X is also a “truck” by the silly definition used for CAFE standards. For BMW (unlike Ford, GM, etc.) a “truck” is only an SUV, no actual trucks. They will outsell BMW by even larger margins when the $35k model starts shipping. It seems Model 3 Sales are 1-2 Months away from 1 Month Sales of it equalling 1 Years worth of Bolt EV Sales, though! And yet the Bolt is still the top non-Tesla BEV in the US. Kinda sad though for EVs as a whole. In that, no one else beside Tesla is really ramping up EV production. Yes, I agree. The question is, what sales can they maintain when the tax credit is gone (or 75% gone on 7/1/19) and the backlog has been worked through. By that point they will, of course, be selling in Europe too. With the new tariffs China will mostly have to wait for local production in the 2020s. Nevertheless it certainly seems that Tesla still has quite technological a lead over its potential competitors. I think Model 3 sales will be pretty steady and continue to climb as they increase production capacity. At least until Model Y comes out. Very good question. I see 20k per month on a steady worldwide distribution basis (of course this is total WAG and I have been pessimistic in the past). Now it is celebration for the fun of it but numbers that matters will come one year from now. I bet some will still sell in China because the tariffs will limit the number shipped over so some people will buy it just to have a car others do not have. Ups I can feel your pain, get use to, it will get worse for BMW and MB……. First in BEVs, Plug-ins, and mid-sized sedans. What smackdown? BMW sales are up. Sedan sales decreased YOY by 3500 or so while Tesla sales increased by 17800 in Model 3. If this shows anything, then that Tesla sales and BMW sales don’t really seem to involve the same buyer groups all that much. And if one takes the Tesla glasses off – it is the same old shift from sedan sales to SUVs that we have seen for years. Doesn’t mean that long term Tesla won’t impact BMW. But this data currently just doesn’t show this. Should be interesting when Tesla starts production of the Model Y.
Yeah, it’s interesting. I was expecting much more a slump from BMW, as by all accounts the 3 Series was the main vehicle people were switching from. That doesn’t seem to have happened yet, perhaps because they’re still largely dealing with pre orders, rather than organic sales. It’ll be interesting to see what happens in a years time – whether Model 3 sales start to hit BMW’s sales more, however by that time we will have a much firmer idea about the EV 3 Series BMW seem to be developing, which could influence existing BMW owners planning on switching to an EV. Nice graphic….but isn’t Tesla more of the rebels? There are still people out there saying that EVs just won’t sell. That’s gonna be a pretty hard position to maintain. And sedans are soft. Imagine when the Y comes out. It will be a little harder in the CUV space. Tesla excels in passenger cars because they make very low profile & aerodynamic ones. With the CUV & SUV space, the vehicles are bit harder to make in EV form since you lose those great aerodynamics such that you need more batteries & raise the cost. They did a pretty good job with the Model X though. Hopefully the battery costs will be even lower by then so they can compete just as fiercely in that space. They made the Semi have a better drag coefficient than the Bugatti Veyron, so aerodynamics is the last thing I would worry about. A CD is not the same as total drag. CD is a dimensionless quantity. The frontal area of a truck is ridiculous. Cd is relative to the surface area — it is part of the Cd equation (part of the divisor). Which is why it’s funny, Jaguar, Audi, and Mercedes have all jumped in at the SUV end. That’s where the sales are. Musk went for a mass market car with the M£. In terms of sales volumes and early profit growth, that may come to be seen as a miscalculation. Y first, then the 3 perhaps. That would have hurt competitors more. Demand isn’t a problem. Y will be another win. Clearly there is still demand for sporty sedans. It is not really relevant because Tesla is manufacturing as many cars as it possibly can atm and growing as fast as it can. If Tesla had introduced the modelY and taken 50% more preorders it would have created even more problems in satisfying that demand. Now when they introduce the Y they will be able to ramp a lot more quickly and they will have the systems in place to handle the volumes. Tesla wants Competition to make “Compelling EV’s”, and at the same time, they need to grow, step by step! The Model 3, at the less popular Sedan space, is a step towards the Model Y’s higher demand CUV space, and the smarter way to grow, 1 step at a time. Once Tesla has proven ability to maintain 10,000 Model 3’s per week, in production and in sales, will be soon enough to start making Model Y’s! Yep…do the low-hanging fruit first….the low profile sports sedans. The less aerodynamic CUVs are delayed until battery costs are lower. Perhaps what you’re calling a “miscalculation” was a good strategy on Tesla’s part. Tesla knew it would take them years to ramp up to meet demand, so why not start with a type of car (sedan) which should have lower demand, and work up to a car (CUV) with bigger demand? As it was, the Model 3 has much higher demand than anyone anticipated. So it’s rather hard to rationally argue that what Tesla is currently doing is a poor business strategy! Yeah but they are all gonna flail unless they get a really cheap source of batteries. Their vehicles are just not all that aerodynamic such that they will either be very expensive, have short range, or both. They’ll get some sales but they won’t be high volume products like the Tesla Model 3. It’s the volume of batteries that’s more important than the cost. Everyone talks about what an advantage Tesla gets from the low cost of batteries from Gigafactory 1. But that’s actually less important than the huge volume Tesla gets. Tesla and BYD are the only auto makers who control their own supplies of EV battery cells. They are also the only EV makers which are swiftly ramping up production. For some reason I cannot comprehend, a lot of people try to dismiss this as mere coincidence. A lot of other Chinese makers are swiftly ramping up production, without “controlling” their battery supply. Have you seen the competing S/CUVs? Boring doorstops and quite ugly. All expectations are that the modelY will sell at least as much as the 3. It is expected to be priced around the same. Tesla thinks around 800k per year. Tesla building compelling EVs, that bring the ICE OEMs a World of Hurt! Umm, a different angle from bmw blog usa. Sales grew 1% in Aug 2018. No hurt feelings. BMW growing overall sales, does indicate that their excellent sales staff can push up their light truck category numbers, without much difficulty. What they don’t care to mention is that their sales figures include 9339 trucks. See the table in the article. Yeah, that BMW pickup is a hot seller! Have you ever seen a BMW truck? SUV’s will be the only growth story for BMW until the modelY comes out. Part of the story is that BMW, like most automakers in the US, are up in their “light trucks” category, while down in sedans/small passenger cars. The All Sales number for BMW is 23,789. Which is about what Tesla sold total, which is also very impressive for Tesla. But why compare truck+car sales when the focus here is on passenger cars? It is not a like for like measure of success. Nonsense. Not in the context of a comparison with Tesla. No. See the tables. They are passenger cars. A terrible result for BMW. You need to see the tables. BMW counts X1 and X2 as passenger cars, but not X3, X5 and X6. You are right, Doggy, but labeling the X3/X5/X6 types of SUV’s as light duty trucks is a stupid idea. And that applies to all the SUV’s built by other manufacturers as well. They are simply large light duty automobiles on a full sized car chassis in most cases. Absolutely correct. The term “SUV” has become merely a marketing label, and no longer has anything to do with how the vehicles are actually built. For example, when Jaguar calls its I-Pace hatchback a “compact SUV”, then you know the term has ceased to have any objective meaning. The “SUV” category is now assigned by the marketing department, not the engineering department. The I Pace is a bad example, it’s more deserving of the SUV moniker than most others in the segment. It has good ground clearance, a decent 4WD system and a proper wading depth. Compare that to most of the other SUV’s on the market and it certainly sits close to the top. It’s no Landcruiser, Landrover, or Wrangler, but they’re 4×4’s not SUV’s as such. It really isn’t up to BMW, or insideev’s, or anyone here to decide what class these vehicles are in. The EPA decides that. If you disagree, please email the EPA with your objections and I’m sure they will get right back to you. Nix, you can use European definition for passenger car and utility vehicle. If EPA has misleading definitions, it most certainly is not required to use them. You are nearly always correct in what you write, Nix. So I hesitate to argue with you on this point. But I must say, if it’s the EPA doing the classifications and not the auto makers’ marketing departments, then I don’t understand how so many CUVs (built on a car frame) have been reclassified over the last few years as SUVs, which originally (but apparently no longer) meant an automobile built on a light truck frame. Also, don’t seem to including BMW’s Mini brand, it’s cutoff in the graphic. It’s specifically BMW passenger cars and only compared to the Model 3, not light trucks and not mini, as highlighted in the post. Including Mini would hit about 18,250. Include Tesla’s whole lineup and you get 23,175, so Tesla still wins by a landslide. We might want to do more research over this next week, comparing Model 3’s, plus S & X, againstst BMW Trend Lines, as well as vs Audi, GM/Caddillac, & Ford/Lincoln! Also Toyota/Lexus, Honda/Acura, and Nissan/infinity! What? You are not making sense. Why would the Model 3 be compared to Light trucks (which are SUVs)? The Model 3 is not an SUV. BMW separates its sales between passenger cars (which includes sedans and smaller SUVs) and light trucks (larger SUVs). The Model 3 beat the entire breakdown of passenger cars all by itself. Meaning the article is ridiculously correct. You should probably go look at BMW’s U.S. sales report for August. It will make more sense then. Well maybe its just me and you are perfectly right. Let me describe my experience with this article. I read “Tesla Model 3 Outsold All BMW Passenger Cars In US” and think “WTF? really? Tesla is selling more Model 3s than BMW passenger cars? So they don’t just outsell 3 and 5 series but the entire BMW portfolio? Should I buy Tesla shares? Then I read through the text and see the linked twit from Alter Viggo which mentions almost 10000 BMW light trucks. What? BMW is producing trucks? So I googled it and only then I realized that you excluded BMW SUVs from your calculation. So yes, the title and the text are definitely misleading. Because most people don’t know that BMW excludes SUVs from their definition of passenger cars. The tweet and story and charts weren’t made up. They’re on BMW’s site. We used the actual chart from BMW’s website. Now, scroll to the bottom of that link, see ATTACHED FILES, and click the BMW August Sales PDF. Notice the long list of PASSENGER CARS are reported by BMW. Notice that light trucks and Mini brand are reported separately. So, our headline says exactly what BMW’s site says. The article compares the Model 3 with all of those passenger cars that BMW sold. Crazy impressive that one car can outsell a whole lineup! There is nothing misleading about our headline or story. You just have to go to the actual source, which is BMW’s website. Have a good day. Everyone who regularly reads InsideEVs should know that in the auto industry, the term “passenger cars” does not include “light trucks” such as SUVs and pickups. I certainly did not find the article nor its headline confusing. There has been much talk over the past few months on IEVs about how “cars” sales have been tanking in the U.S. while “light truck” sales have been booming. It’s mpressive numbers for sure, but article is claiming Model 3 sales beat all sales of BMW passenger cars. I get leaving out the light trucks classification, but not sure I agree with leaving out Mini, as that is part of BMW. And yes we should celebrating that an EV is doing so well! In BMW’s sales report, mini brand is also separated, just like light trucks. We just used BMW’S information as published by the automaker. A month of late nights and multiple hours of intense research. Give it a rest and be thankful and happy that a company is heavily pushing EV adoption. If you’ve followed us for years, you’d be sure these aren’t made up numbers. If not, take the time to read the report card model recaps with specifics about Tesla estimates and historical accuracy, adjustments, etc. And are you real for that matter? Perhaps you are a bot from GM or Esso, hmmm? Nozuka, if you have a more accurate source for EV sales numbers, with a longer track record of success, by all means please post the link…..
Never different per quarter by more than a 100 or so Vehicles, compared to Tesla’s Stated Quarters Numbers, is a bit better than some Random “Made Up Number!” Go back and review! Give us a post with Inside EV’s Numbers vs Tesla’s Quarter Reports, if you are seriosly challenging these figures. How many decades or years are you projecting before you don’t consider them new ? They have technically been in business 15 years, yes? I’m not looking for a fight, but do we magically call 25 years no longer new? Well, most automotive companies are like 100 or older. So, pretty new. There’s never been a new, successful automaker in the U.S. since Ford. In the automotive world, new could be 20-30 years or more, haha. Another way we may ascertain that they are “Not New” will be when their YoY sales plateau, and they are no longer in a growth mode of business. Which may be 4 years from now, or it may be 8 or more years. But it will be interesting to watch them grow their business! Not as new as GM, if you consider bankruptcy. I thought Chrysler was the last successful auto company in US in 1925? Ford was also bailed out, it simply didn’t come from the government, but from private sourcing. That’s why they are in such trouble financially these days, large loans, dropping sales, no EV plan, outdated CUVs (for the most part). Yes, Ford was actually partly involved in the government deal as well, since they didn’t want to be left behind when the others took the bailout. However, they didn’t receive the funding. You’re correct about private sourcing, although, as far as I know, they were never considered bankrupt like the others. The first car Tesla designed and built rolled off the assembly line in June of 2012, about six years ago. Prior to that they were (gross simplification) stuffing batteries in rolling Lotus chassis. I’d say their path as an actual automaker began June of 2012. Basically one fresh-platform model cycle in the car business. First Roadster was a proof concept – motors, batteries and Tesla OS. A huge achievement that gave them the confidence to build the all-new, groundbreaking MS.
That was the research and development stage. Important for sure and they also nearly didn’t make it out of this stage. He Did Say “gross simplification”, if you note! When Tesla stops growing geometrically and sells in all categories, of course. Bunny, How old is the 1st Tesla Production Line Car: The Model S? Its first Deliveries were in June 2012! So, I would say: 6 years old in the car busines, with 2,500 copies of their “Proof Of Concept” Tesla Roadster, that Showed an EV can sell, at a high Price ($100,000+), Go Fast (0-60 in 3.6 Seconds), and far (245 Miles) per Charge, preceeding that. Before the Model S, Tesla was really an advanced Concept Car Maker, and the Roadster in many ways outperformed a more expensive $170,000 Ferrari, so maybe Tesla could have charged more, and done better. If you take that the Model S & Model X are just Boutique Cars, as some call them, they are just getting started this Month, at 5,000 Model 3’s per Week! Tesla will probably remain in super-growth-mode right up to the point when EVs start dominating global sales… So likely another decade or so. Only then will Tesla be directly comparable to established car makers. I’d say look at the business model. Established auto makers don’t show rapid growth. Perhaps when Tesla stops growing rapidly, then it will be time to think about not calling them a new company any more. Has BMW grown geometrically in the last 7 years? Well when you are starting from zero…………..
Tesla has had its share of financial help along the way so I would not be so smug as your post implies. Hopefully Tesla finds that spot of consistent quarterly profits so they can continue to grow and be stable by time the economy tanks again. Are you under the impression that BMW hasn’t gotten support from the German gov’t? They got a bailout under the German “New Stimulus Package 2009” too. Not to mention how BMW’s US based parts suppliers were bailed out under the US “Auto Supplier Support Program”, and BMW’s German based parts suppliers were bailed out too. BMW/Mini also benefited from “Umweltprämien” cash for clunkers laws in Europe and the United States. The car scrapping bonus “Umweltprämien” in EU was/is more comparable with the ‘Go electric’ incentives of 4,000 Euro in GER or 7,500 $ tax credit in the USA. Adding a tax or cash bonus to buy new cars in 2009 or EV’s nowadays is rather different than a ‘bailout’ where the state is taking over a percentage of share ownership like in Commerzbank. Government credits and incentives are to induce buyers to invest in green technologies. They are not exclusive to Tesla. Your point has no merit. Actually it is directly comparable to the “Cash for Clunker” program in the United States, which was promoted and done as part of a set of bailouts. The only money they got, that was not a program available to all, was a loan that they paid off early with interest. I see, you think Amazon sells books… the same way you think Tesla sells cars. Not the same way. Tesla gets more than 90% of its revenue from selling cars. It’s been at least several years since Amazon.com got 90% or more of its income from selling books. These are impressive numbers indeed, however we need some perspective here. Tesla Model 3 sales are still fulfilling pre-orders, BMW is not, and neither is any other mark. Why this matters is, in theory, Tesla could just sell all the preorders next month, and claim ~400,000 sales figure. It would take year to fulfill the orders, but they could do that if they desired. But then the next month sales figures would be near zero. Now that’s an absurd example but the point is that we can’t compare sales figures until AFTER all the pre-orders are met. The luxury market is saturated, and the luxury electric market is growing faster than Tesla is fulfilling their pre-orders. By the end of 2019, about when Tesla is expected to have all the pre-orders done and be making cars for everyone else, BMW, Mercedes, Jaguar, and probably others will have competitors, (some are already for sale). So I will suspend my applause until I see how Tesla fairs actually competing for market share. However, I will applaud them for singlehandedly creating the electric luxury market. What is the sound of the single hand clapping? Recognize that Tesla can go at this pace and still take two years chipping away at pre-orders only. The auto market is only so big, but you have to appreciate one thing: China. Oops, I think I just dropped something. But what was it? Yes, that’s definitely an appropriate caveat. I’m reasonably sure that this is what many have argued at Nokia headquarters in Espoo ten years ago too. Also, just the economy segment of Honda Civics. Tesla has broad appeal. Who’s buying a $50,000 Model 3 instead of a $20,000 civic? That’s a very, small cross market there. Surprisingly, that’s incorrect. The top 5 trade-ins for the Model 3 are the BMW 3-Series, Honda Accord, Honda Civic, Nissan Leaf, and Toyota Prius. I know about the trend, but I just can’t fathom it. Ideology driven (pay way more for an EV because they want it), or a select few that do high miles and can actually pay it back over the 5+ years they own it? but what about the couple thousand people who have put $2,500 deposits down since June for delivery’s coming in 2-4 months? Also if the word of mouth continues to spread as more people get their cars, their may always be a backlog or 1 month lead time for some models in some area’s, theoretically they may never fill all pre-orders if people continue to pre-order. It will be years before Tesla has to out actively selling cars. Do the maths. Incorrect. Tesla cannot take credit for a sale, or receive the related revenue until change of ownership – ie delivery. So your argument is rather silly, no? It depends on the State law. Some few States actually require payment at the time an order is placed, not at time of delivery. I think Texas is one of those States? But your larger point is on target. If Tesla demanded that all its reservation holders pay in advance, then Tesla would get in legal trouble even worse than the Tucker Corporation did when it collected payments in advance for some options on the 1948 Tucker Sedan, before that car entered production. The old “moving the goal-posts” gambit. With every Model 3 sold there are a multiple of new orders. The Model 3 will do its own advertising. Also, Tesla will not stand still during that time, so the OEMs will have their work cut out for them. Tesla is, in USA & Canada Only, now taking Direct Orders, from people who do not have a Reservation, and who have not yet even had a Model 3 Test Drive, as well as some that have! As September progresses, there will be even more such New Orders, all above and beyond the “Reservation List! If this open to all offer continues for the $35,000 Model 3, next Spring, orders will continue to grow! Then, when you can just Walk into a Tesla Store and Lease a Model 3, with 2-4 months lead time and No Reservation, orders will increase, again! Friends sharing their own Model 3 with others, will also drive sales, as well as constant news channel discussions! 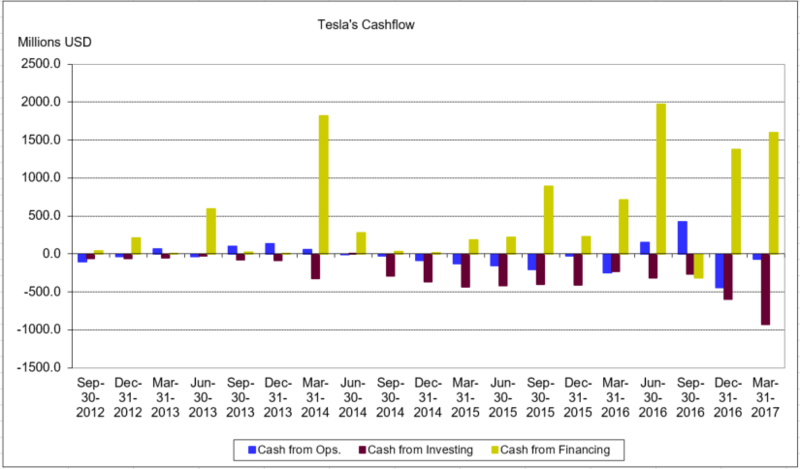 If Tesla Advertised Once, per Quarter, 1 month befire the Quarter End, it would Also drive more sales! Isn’t that the same argument that the anti-Tesla mob used in 2012 and 2015, to argue that as soon as the pre-orders for the Model S and the Model X were fulfilled, Tesla’s sales would drop like a rock? Remind me again, what happened with Tesla’s sales after those pre-orders were all gone? What, you say sales grew significantly in later years? So here you are, making exactly the same argument after it failed not once, but twice. Let’s see what Model 3 sales will be like after all the back orders are filled, and it’s on the market like any other car. Sales of the Model 3 are running high with each one being pre-sold they’re going from the assembly line straight to waiting reservation holders. Let’s be happy that an automaker is selling loads of EVs. Aren’t we all here in support of EV adoption? Of course, I was basically saying that Model 3 sales aren’t typical of how the market works on a regular basis. But I’m still glad to see them doing well. No doubt! Model 3 sales are not yet typical! They are still Low from what “Typical” sales for them will be, by next Christmas! Yes, 2018 sales will obviously beat 2017 sales. And 2019 sales will beat 2018 sales. But will 2020 sales exceed 2019 sales? Most likely, they will not, as the pent up demand will have been met and the 3 will stabilize into whatever sales level the market demands for the long run. Put another way, there has never been a car, where year after year without end, it sells in increasing volume. Demand gets satisfied, and sales numbers go down. It’s just simple economics, it’s not a knock on Tesla. Some 5-10 years later, you get a demand spike when the model gets re-designed, and then you get the slow taper downwards again. It is a poor winemaker who drinks his own wares. Or Kool Aid, as the case may be. Don’t be another Zach or Fred. It’s sad when the Tesla bashers start believing their own FÜD… or start believing their seven imaginary electric cars are real. By then the model Y will be released and the demand will likely be even higher than that for the model 3. Discounting the number of M3’s being delivered because of the backlog doesn’t make much sense. Having more demand than you can produce should show success, not failure. I’m sure this is a problem BMW wished they had. Yes I’m sure BMW would like to be in a similar situation. I’m not discounting Tesla’s situation at all, I’m just saying that they aren’t in a situation most cars typically experience. And that I’d like to see where the sales numbers would be if Tesla didn’t have this unusual situation, and both companies were selling cars in a similar manner. The situation is unusual because people see that Tesla is a true agent of change in marrying ecology with mobility. As with Apple, every customer becomes an evangelist for Musk’s vision. The Model Y will be released in a totally different market to the 3. The 3 is currently one of a very few EV sedans on the market, and by far the one with the most range. In 2021/22 when you may be able to buy a Y most manufacturers will have at least one EV CUV on the market. I’m sure the Y will sell well (I’m personally interested in one), but I, like many people, will be comparing it to all the competition out at that time. That’s going to dent sales a bit. We’ve already seen the answer to that. The exact same thing was said about the Model S while they were selling to reservation holders, and with Model X reservations. Tesla blew through both on their way to a full order of magnitude higher number of sales after “pre-sold” cars were all sold, with combined Model S/X sales just increasing yet again YOY from 2016 to 2017 (latest full years of sales data). Based upon the history we know, the roughly half million reservations should lead to a full order of magnitude larger total sales. Tesla will be fine. Their best sales folk are their customers so far. Isn’t word-of-mouth recommendation something to behold. No need to waste millions on ads. Same doubts for Semi, New Roadster, Model Y, And Tesla Pickup, WILL BE SHARED! But, so what? And, some will by competing EV’s! Still, so what? Every great EV Sold is 1 Less ICE Vehicle Sold, immediately, and even less in the Future, as friends buy what EV their Friends bought, or a different one! Model S now Sells 4x per year, what its Reservation List was! Model x Sell 2.5x what its Reservation List was, Per Year! Model 3 sales will likely peak at Production Capacity of about 500,000 per year, and stay there! A single month is not proof of a trend. There could be inventory or incentive issues on either end of the equation. There isn’t even R.L. Polk registration data available for those cars yet, since Tesla refuses to publish monthly sales. All readers would do well to hold the celebrations. Your projections tend to be accurate, but until registration data is published in October, they are just that: projections. This is not FUD; it is simply prudence. Moreover, this graphic is both poor quality and in poor taste. It merely reinforces the perception of us BEV faithful as idealistic fan boys. A single month? What about the last several? What about the huge back order? Let’s support EV adoption and be happy and positive about the fact that any EV could displace ICE sales. A huge backorder is exactly the kind of temporary consideration that would affect this result. What is the demand going to be once all orders have been delivered? While I expect it to be high, that remains to be seen. Every nuance of Tesla’s business is being breathlessly reported. Not so for BMW USA. There are many homologation delays throughout the industry ongoing for MY 2019. Maybe BMW is short supplied and running out of 2018s. Maybe a vessel with significant volume was delayed until after month-end. This says nothing of the overall market trend away from PC to LDT. We do not yet know all of these factors. We do not even know the most basic part of the equation–exact sales for one of two parties. Conclusions drawn from incomplete data are inherently incomplete. Well, we must be very close since Elon Musk just retweeted it, which probably confirms that it’s true. If it wasn’t true, he’d likely be very hesitant to retweet the story since he’d have to justify that when the quarter ends and numbers are disclosed. Yeah, Elon would never tweet something without first rigorously verifying complete accuracy and truthfulness, lol. I hear you. I’m just saying that it would make sense for him to actually look at the numbers before he shoots it out to 22.5 million followers. But, who knows right? People are already replying to the tweet and saying that if the numbers are incorrect he is spreading misleading information and will be getting himself in trouble. I knew right away that people would say that. Haha. The problem for all other EV makers is they can’t find the batteries. Watch this space as that problem unfolds. Plus the Tesla/Panasonic batteries seem to have a fairly substantial technological edge. Hard to order enough in advance if battery makers aren’t making enough. I think VW said they were having to source from no less than six battery cell suppliers (!) because no one supplier could give them enough? I continue to be amazed that there is such denial among EV advocates about the looming near-term shortage in EV battery cell supply. Tesla and BYD control their own supply; other EV makers are already playing a game of “musical chairs”… but in this case, there’s more than one chair too few. Why would battery makers not make enough if they get the orders? That simply doesn’t make sense. They need a lead time on larger orders (something like two years, maybe three) to actually build the factories — that’s all. “Idealist fan boys” are always welcome amongst “us BEV faithful”! Our non-ICE goals are aligned, however, our methods and motivations may be quite diverse, in how we address and arrive at mass adoption, of non-combustion, sustainable, pollution free transportation. EVs hopefully involve EVerybody EVerywhere EVentually! It is amazing how envious some folks are of what ALL industries refer to professionally as massively high “Brand Loyalty”. Companies spend tons on money researching their own Brand Loyalty, the Brand Loyalty of their direct competitors, and what they can do to increase Brand Loyalty. The more complains we hear, the more it is clear that Tesla is winning the Brand Loyalty battle, converting more and more buyers who USED TO BE just as big fans of other brands as they are now Brand Loyal to Tesla now. You must be new here. Model 3 production has been ramping up strongly since the first of the year. That’s 8 months, for those who are counting. Good Car Bad Car report of August US passenger car sales has the Model 3 in 5th spot. Their report of sales by brand for August has Tesla above BMW, Audi, Mercedes, Chrysler and more. One of the more important questions why does BMW have such a small penetration of the US market? I love my Mini … but I lust after a Model 3. Electric Mini Cooper coming in 2022 I think. Horse and buggy in a world of Model Ts. Love the cover photo! Kudos Eric! I absolutely love the F out of our Model 3. I wouldn’t trade it for any non-Tesla car on earth. I took delivery in August, so I had a very, very small contribution to the number. Lots of my friends, family and neighbors are extremely impressed by it, so maybe the influence will be larger in the future, lol. Ah, word of mouth is king. It’s impressive Tesla beat BMW for passenger cars. Why do you include X1 and X2 numbers (suv/crossover), but don’t include X3 and X5? That’s directly from BMWs sales report. That’s how they classify their vehicles. Scroll to the bottom and click the sales PDF. The BMW X1 and X2 are based on the ULK2 platform from the Mini Countryman. They both share the same chassis, and despite the “X” classification, it is very much a car. Especially the Front Wheel Drive “sDrive” ones, that are really just station wagons. And Mercedes, Audi, Jaguar, Porsche. The ‘backlog’ is growing as the cars are delivered … more in than out. And if that is the Fact, Elon will report that, at Q3 end, in about a Month! I don’t doubt it is already trending that way, with YouTube videos Gallore, Friends with Them, and about 100 Performance Model 3’s for Test Drive Vehicles getting sent to Stores in USA, or maybe USA + CANADA! Indeed! That certainly appeared to be the tipping point for many legacy auto makers. I’m curious, if what several commenters claim about BMWs year over year sales didn’t decline, who is Tesla taking market share from..? Personally I’d think BMW and Audi the most likely, partly because of price, but also because of their high-tech image. Software engineers are keen on Tesla, and used to be keen on BMW. Mercedes-Benz is a little bit less tech-focused in terms of their image, if not actually in terms of products. We don’t really know how much Tesla is taking sales from BMW. While 3-series sales plummeted, some suggest that this is in part due to a model year change, and thus not very indicative… On the other hand, Tesla said that the 3-series *is* among the top five car models people are trading in for the Model 3. It’s a tricky one. The Luxury sedan market has contracted year on year for the last few years, however it’s grown for the first time this year due to the Tesla Model 3. Most of that contraction has been taken up by an expansion in small SUV’s and stable/growing sales for most of the luxury manufacturers overall. It’s probably a mix of a few things, including a small percentage of the luxury sedan market from others, cannibalization of other EV’s (like the Leaf), the stacking of purchasing by the pre order process, some people buying into the small/midsize luxury market from another segments and some people upgrading to the Model 3 how wouldn’t usually have purchased a new vehicle at this time. It doesn’t seem to have affected BMW or Audi’s sales much yet, although as aspirational brands they may have lost some customers to Tesla, while picking up sales from new buyers. The way Tesla setup its options (Autopilot, FSD, All wheel Drive, Performance version) each increament option takes a swipe at entire BMW series. But BMW made a profit in August, and Tesla? As a new auto manufacturer pushing new technology, Tesla is growing as fast as it can by reinvesting their excellent profit margin per vehicle into growth and thus delaying paper profits to grow as quickly as possible which shows up with these delivery numbers being discussed here. What do numbers through March of 2017 have to do with anything going on now? You do realize this is now 2018, right? I guess if you’ve been mindlessly cut and pasting the same graph over and over and over endlessly for over a year, not much really matters to you anymore, eh? That means infrastructure (the means of production) always comes before profit. Ask Amazon about infrastructure v profit. Yes, no doubt BMW made a net profit in August, and Tesla has not been doing that, at least not until this quarter, and perhaps not even now. But Tesla is growing its production rapidly, and BMW isn’t. So which business strategy do you think will result in a greater market share — and bigger overall profits — within just a few years? BMW X3 , X4 , X5 are not in the list. They aren’t categorized by BMW as passenger cars. It’s BMW’s official info. Also, scroll to the bottom and click on the sales chart PDF. You’ll see the vehicles in the categories as reported by BMW as well. If they don’t carry passengers, what do they carry? Are sedan owners prohibited by law from buying SUVs? This is BMW’s breakdown, not ours. The larger SUVs are classified in light trucks category. The Model 3 would be hard-pressed to be classified as a light truck. If you add up BMW passenger cars and light trucks, the total for the month just about matches Model 3, S, and X sales. So, we could say Tesla’s lineup sold same as BMW’s lineup, give or take. Isn’t the Model X also a “truck” under the CAFE rules? I think so, since it’s advertised as an “SUV” despite the fact it’s obviously a CUV. Not that this has anything to do with the subject of this article. So total Tesla sales are closing in on BMW total sales if we look at all vehicles sold. Very impressive considering that Tesla has not yet introduced the Model Y. Can you say original iPhone vs everyone else? Tesla makes cars with “Zen” interiors. It’s the most relaxing car I’ve ever driven. Think of Scandinavian designs. I liked the old Nissan Silvia cabin. It looks a little dated now, but to concept of minimal distraction is still appealing. Diff’rent strokes for different folks. You say “boring”, others say “elegant simplicity.” If you were to say “Spartan”, others would say “uncluttered”. No one car is going to appeal to everyone. Not even Tesla’s cars. I didn’t know BMW made trucks. Oh maybe an SUV is considered a truck. BMW made tons more pollution even with lower sales. BMW’s were in a lot more accidents on a % per vehicles on the road. BMW is more foreign parts and US trade imbalance than USA made Tesla. Oh those aren’t things to be proud of if your BMW. But amazing if your TESLA. I helped with our Tesla model 3, we love it. Actually – it is the owners of the cars that make the pollution, not BMW. Actually BMWs biggest assembly plant (mostly SUVs, ie. “trucks”) is in the US (South Carolina) and I think more than half of its production is exported. Comparisons are (or often are) odious. But they certainly do own most of the premium EV segment for the foreseeable future. This may be BMW’s breakdown – but it is insideEV’s choice to only report on one category while leaving out the other – whereas of course the BMW press release reported both. This is exactly the kind of cherry-picking negative news that is usually directed against Tesla. Which doesn’t make it any better if it is directed against BMW. The myopia in such an article is of course huge. First because BMW doesn’t even sell 20% of its cars in the U.S., whereas the share for Tesla now with the Model 3 is considerably above 50%. Second as BMW brand total sales were up, not down (including MINI down slightly). The shift is from sedans to SUVs – as it has been for years. The 3/4 series sales started declining in 2015 if one bothers to look. And last – when Telsa delivers 17800 Model 3 and BMW sales are only reduced by 3000 or so in the sedan category, then what this shows seemingly the most that the claimed competition between Tesla and BMW does not seem to really exist in this form as some website try to push it as a narrative. And it’s also maybe because the next generation 3 series is also on the way. Sales of 3 and 4 series (adding 4 in here because prior to 2016 they were accounted in the same numbers) for August over the last few years (2015 being peak 3/4 series). So while total 3/4 series are down significantly, sales of the equivelent SUV are up significantly, leading to an overall similar sales volume of vehicles in that size segment. That suggests, rather than direct competition from other manufacturers, the competition is within the brand itself – correlating with a shrinking of the Luxury sedan market and the rise of the Luxury SUV market. One year on year trend of one vehicle does not a story make. What everyone seems to be ignoring, at least everyone complaining about this article ignoring the light truck category, is that sales of the Model 3 sedan are rapidly growing even during a period of significant downturn in sedan sales. That’s a measure of the startlingly high demand for Tesla’s cars. As such, articles like this one are entirely appropriate for a website whose focus is EVs. It’s not “misleading”; y’all are merely considering the situation from the wrong viewpoint. The 500,000 reservations indicates that. I’m just pointing out that antriks comment about the fall in 3 Series being an indication of direct competition doesn’t bare out with the facts. Look at the longer trend and current sales of the Model 3 appear to have little impact on the other premium brands. No. It absolutely is not “cherry-picking” to talk about “cars” as a separate category from light trucks. The industry treats them as separate categories, and does not consider SUVs, pickups, minivans, or other light trucks to be “passenger cars”. If you want the correct overall category, it’s “light duty vehicles”, which includes both cars and light trucks. Now, how many article titles have you seen that use the term “light duty vehicles”? It’s not a term you’re often going to see used in articles for a general reading audience. It’s absolutely inappropriate for you to accuse IEVs of cherry-picking here. If that’s “cherry-picking”, then the entire automotive industry is guilty of cherry-picking every time they report sales figures. It’s all good I think. Pretty sure the Germans are ok taking the hit while they figure out how to make pure EVs out of their models. An updated EV 3-series with decent range would be excellent and I’m pretty sure BMW will make it happen in the next few years. They see their numbers, they see the phev numbers are up, rest are down. Those guys know how to add 2 and 2 together. I really don’t understand that “GOT ‘EM” fist pump attitude I see so often on these sites. The make of the EV doesn’t matter, what matters is that there’s one more of them out there. If it was BMW, GM or Nissan leading the charge and selling that many i3/Bolts/Leafs in the US and Tesla numbers were more modest, would that not be just as good? I suspect many need to be more EV fans rather than Tesla fans. Good on Tesla for the deliveries. I’ll stick with my BMW though, personal preference. This article is not about Tesla versus other EV brands; it’s about Tesla versus combustion vehicles. Look at the graph: a lot of the BMW sales in the US moved towards light trucks…also 3 series is being revamped. Sales are always much lower until the new model comes out. Next month Tesla Brand > BMW overall… and likely for the year as well. We do realize. It was BMW’s classification system, not ours. The Model 3 is not categorized as light truck or SUV. It was the Model 3 (one car) against BMW’s entire lineup of Passenger cars. If you add light trucks, your math is correct. So then, add the rest of Tesla’s lineup as well, including their light truck (SUV), the Tesla Model X, and you still have almost the same numbers between the two companies. But why are you doing cherry picking then instead of providing the full picture? The numbers show the ongoing shift in sales from sedans to SUVs and not BMWs to Teslas. Again, we didn’t cherry pick anything. We used BMW’s numbers and class breakdown. Give it a rest and stop arguing. The article is as accurate as the title. The Model 3 outsold all BMW passenger cars. Simple. End of story. We didn’t mention SUVs or the Model S or the Model X and BMW doesn’t refer to its larger SUVs as passenger cars. The Model 3 would be hard-pressed to be classified as a light truck or SUV. It seems you’re the one cherry picking. We’re doing our job and providing sales reports. No more need to comment on this post since you are continually posting incorrect comments. Toyota sold 30,141 Camrys in the USA last month and sold 43,331 of them last December due mostly to the new design. That’s only one midsize sedan. When you take into account all midsize sedans sold in the USA and then take into account sales of all ICE vehicles, you begin to get a clearer picture of where Tesla really stands. On top of that, when you take into account all the long-range EV’s the big boys will be bringing to market within the next 5 years, you should begin to wonder how much of a bite they’ll take out of Tesla. Will Tesla have to slow down production of the Model 3 within 5 years? I believe so. Perhaps that will happen within 3 years when most Tesla fanatics are driving a Tesla. I wonder if we will see new phenomena develop, where people stop buying new LICE cars and stick with their old ones while they ponder a move across to a Tesla BEV. This could mean new LICE sales stall but not immediately translate into a new BEV sale. It is worth pondering because the resale value of LICE cars is going to fall off a cliff in another five to ten years. That’s definitely a trend IMO. It’s something we’re doing ourselves. We could swap out our old Estate, but I want to wait another couple of years until there are few EV CUV/SUV’s on the market at a reasonable price – I’m kinda waiting for the EV XC40. We swapped our Truck for another ICE because the old one was not reliable and it’s likely there’s no proper EV truck going to be on the market for the next 5+ years, but SUV’s are going to be popular in the next couple of years. Why is this so “hard to believe”?. Unless you are drinking the FUD cool aid. Knowing BMW this will bother them and it has to. This is good for the electric community, the industry overall will grow with more investments coming. Notice that US definition for “passenger car” is rather odd as it excludes BMW X3 and X5 cars. Therefore, we need to wait for September sales before we can declare that Tesla is bigger than BMW in absolute US car sales volume. Trying to be serious. Are those numbers both based on orders or delivered product? There is a massive difference. All of our sales articles are about deliveries. We don’t track production or orders. Congrats! Musk deserves so much. A immigrant can make several American dreams come true! At this moment, I expect Tesla Model 3 to outsell all of BMW for the next 24 months. This is because at a rate of 5000 cars a week for the next 104 weeks (I’m not going to account for increased weekly production rate in future weeks), that’ll be 500k cars, which will be close to what was the number of initial reservations plus new customers that have been interested in the past 12 months and the next 24 months as well. it’s pretty simple math really. Just when Tesla is going to start selling the TM3 in Europe is, at present, a guessing game. According to the article linked below, don’t expect that before mid-2019. It doesn’t help the the BMW 3-series is reaching the end of its shelf-life, the new 5-series is underwhelming and their other vehicles are absolutely uninteresting.